I made it ! I made it ! I made it ! Sorry for that but I just love reaching my goal, ok I didn’t reach my original one of Caoimhe’s Birthday but there was no way I was giving something I was not 100% happy with so I accepted that but I really did want the bag finished for a post today and its done ! and now for the drumroll …. The pattern is from Lucy at Attic 24. I wanted to add a thin stripe of dark purple with the lighter shades and this is why it was frogged so many times as the original pattern is just for rows of tr crochet and I added in the thin stripe in dc and had to take into account the increase rounds in the base. After finally getting that right it was plain sailing like the original bag from Lucy. My original picture in my head had flowers up the side of it so added these on afterwards with more of Caoimhe’s favourite colours. She knew about the bag and the colour of it and picked the colours for the flowers but didn’t know what exactly they were for. It was nice to keep something as a surprise for her with the bag ! 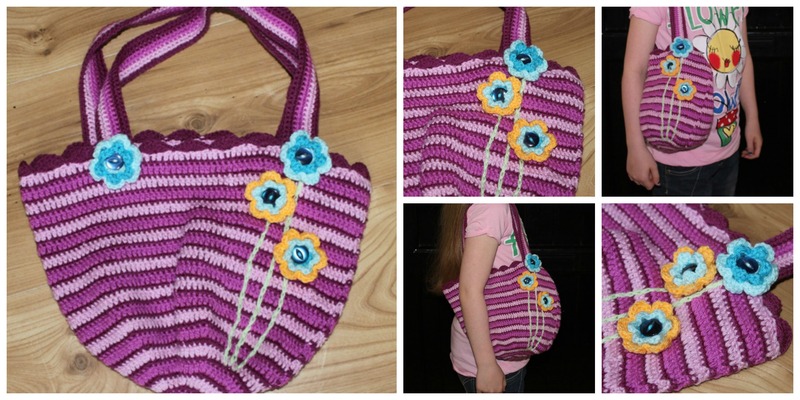 The bag was done in Stylecraft Special DK yarn with a 3mm hook. For today’s meme I’m checking in with Tami. This entry was posted in Crochet, Finished object and tagged Crochet, Tami. Bookmark the permalink. Adorable–both the bag and the model:) Love the color combos. Looks like the recipient is super happy! I’m so glad you finished it! For some reason, in my head, it was significantly larger even though I knew it was for a young(er) girl. I wasn’t expecting it the size it turned out (not that I dislike it or anything). She absolutely loves it! It’s such a great size for her. Excellent job, Ruth. Congrats on a lovely finish Ruth. What a great bag. The dark purple stripes really make it – sounds like it was a bit of an ordeal but it was sure worth it. And she looks thrilled with it! Well Done! Looks great, you did a fab job, who wouldn’t love it, Caoimhe looks really pleased, lucky girl…the flowers were a great addition too. 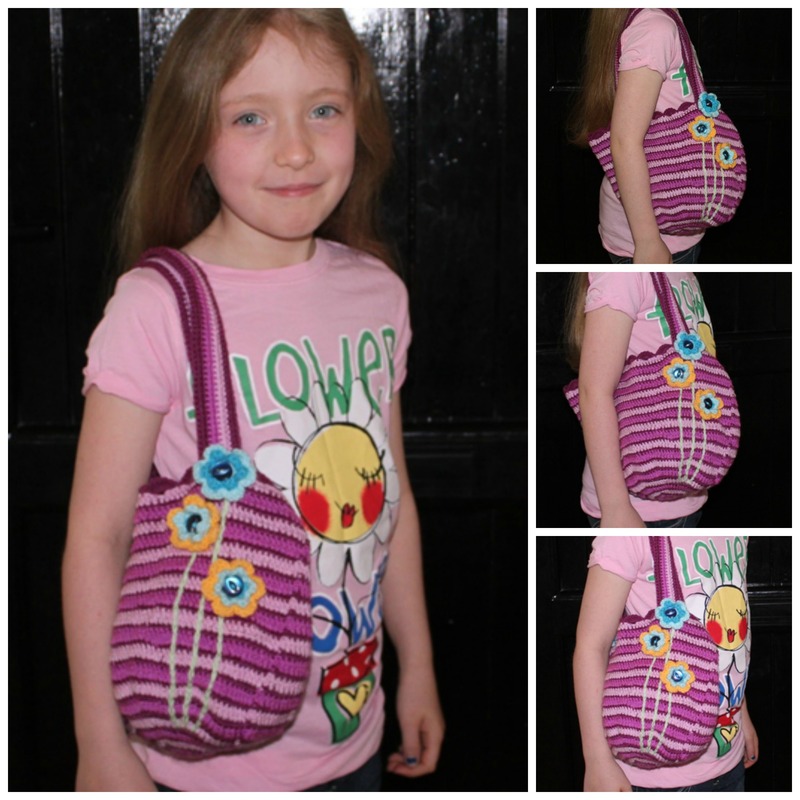 A girl and her bag–no cuter pictures around! You did a fantastic job Ruth, and once again, I say, your girls are lucky to have you as their mama!